Have you ever wondered how to make crazy bread? You are in luck. Years ago in college, I fell in love with the Little Caesar’s Crazy Bread. This delicious butter and garlic flavored bread is a treat. The Crazy Bread is even better when you make it with this copycat recipe. If you have never had these freshly baked bread topped with the flavors of butter and garlic, then sprinkled with Parmesan cheese, you are missing out one of the best side dishes to have come out of a pizza place. These are served with their Crazy sauce, but you can eat these plain or with your favorite marinara. Whenever I have ordered pizza here, I have always ordered some of their crazy bread. We will start this recipe with a basic bread dough that you can use your food processor to help you put it together. This recipe also works well with a mixer, or even by hand. Unlike the restaurant, we will use real butter for this recipe. I bet you will find it makes the crazy bread even a little bit better. You could also make this recipe with a can of pizza dough if you desire. For this recipe, I like to use yeast that I buy in bulk. I find it when you buy a pound of yeast it costs a lot less than buying individual packages of yeast at the store. I have found yeast at big-box stores such as Costco, Sam’s, or even Amazon.com. 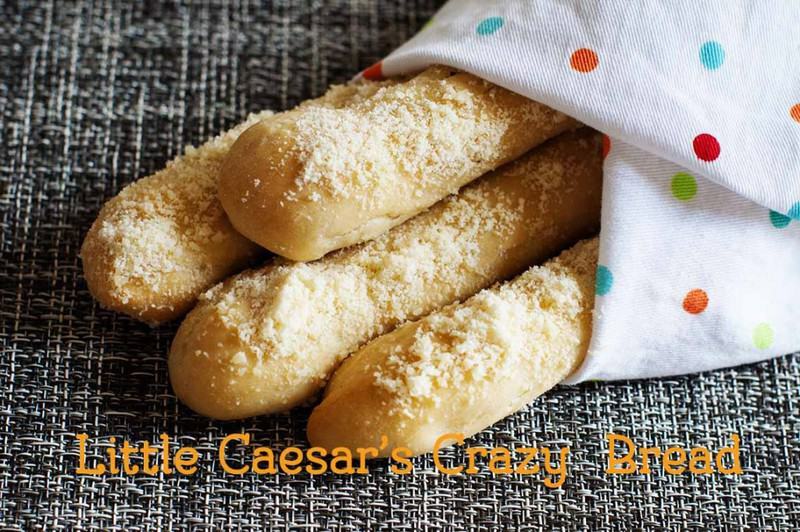 I know the secret to making Little Caesar’s Crazy Bread. Go crazy at home when you make your own crazy bread. Place the 1/2 cup of warm water and yeast together in a medium bowl and whisk together briefly. Allow the yeast enough time to bubble up and become active, this should take a few minutes. If the yeast is inactive, you may need to replace the yeast and try again. Add room temperature water and oil to the yeast mixture and stir to combine. Into a food processor bowl pour in flour and salt, pulse to combine. Add yeast, olive oil, and water through the tube of the food processor and process. The dough will form into a ball. Process until the dough is smooth and elastic. The dough will be sticky if you are going to use the dough immediately or within a few days place into a bowl that has been sprayed with non-stick spray, cover dough with plastic wrap. Let rise until the dough has doubled in size, this may take up to 2 hours. Gently pat out the dough on a floured surface into a rectangular shape. Cut the dough into two equal portions down the middle. Then make about 8 cuts horizontally across the dough. Spray a baking sheet with non-stick spray. 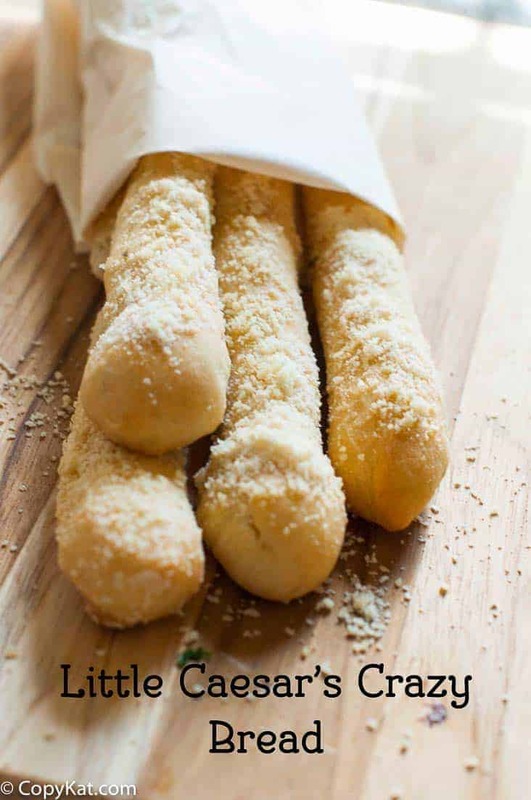 Roll each portion of dough into a breadstick. Bake in the 375-degree oven for about 18 minutes or until the breadsticks become golden. Remove breadsticks from oven, mix the melted butter and the garlic salt. Brush the garlic sauce over the breadsticks. Sprinkle Parmesan cheese over the breadsticks. I love little Caesar crazy bread, Olive Garden breadsticks and Pizza Hut breadsticks. All three are my favorites. Olive Garden is my 1st fave, because paired with their amazing Alfredo sauce, and ice cold salad, the others don’t compare. For that reason only. LC and PH ar tied. I miss little Caesar’s breadsticks being a dollar. I would go there’s four times a week otherwise. Instead making my own next time. I hope you enjoy the breadsticks. TIME SAVER: Similar to Manny i also managed a LC store many years ago. We used the hand tossed dough which was made fresh that morning and allowed to rise at least 4 hours (as opposed to the pan pizza dough which was cooled and set overnight). We simply stretched it out on the pizza pan – used a pizza cutter and cut it into strips then straight to the oven (no forming them into breadsticks). When they came out we brushed them with garlic butter (yes real butter) then using a large shaker (filled with 50% Parmesan cheese and 50% kosher salt) we coated them then in the bag and out the door. Did you ever make the pepperoni crazy bread. It’s been off the menu for YEARS but was amazing. Its essentially crazy bread with pepperoni inside….any ideas how to make that? I have never made this before, I would guess you could just add some pepperoni to the dough, and make it just the same. Ahh, there are very few things that tempt me to cheat on my diet, and that’s rolls from Ryan’s, breadsticks from Olive Garden, and Crazy Bread! It’s so worth the consequences of eating gluten. BUT I love you so much, because I just made this gluten free and it was great! I used Great Value GF AP Flour and I had to add nearly a cup extra of water. I just dumped it in 1/4 of a cup at a time until it formed a dough ball. Then I stopped mixing it, since kneading does nothing to GF dough. I used half the dough to make breadsticks and froze the other half to make pizza later. I pulled them out after 18 minutes, they didn’t turn brown at all, but the insides were fully baked. Obviously the texture is not the same as kneaded regular bread, but it’s pretty good for GF. The cheese and garlic spread on it was spot on. Thanks for the recipe! Turned out great, will be making again, the kids polished them all off. Do you have a recipe for _stuffed bread? The cheese is on the inside. I am not looking for recipes like this. The cheese must be on the inside. You couyld possibly make this dough and wrap it around mozzarella sticks? That was for Ashley. Dude clearly loves Crazy bread!!!! If I’m not planning to use this right away do I store it in the fridge?Can it be froze? You should be able to leave the dough in the fridge for a day or two before making it. I personally have not frozen the dough before. do I let the pizza dough rise in the fridge or at room temperature? I would let the dough rise at room temperature. Your recipe calls for instant yeast. I only have traditional dry yeast at home. Can I use that instead? It should work just fine, it will need more time to raise. how much longer do I need to wait for it to raise? Until it’s doubled in size I’d say. This is crazy delicious!! Comes very close to the original and is so easy to do. . I managed a Little Caesar’s years ago. Crazy bread was made from the pizza dough and from what I remember that is the basic dough recipe. Only thing different was that we used stick of butter/margarine mixed with a tablespoon of minced garlic and heated it in the microwave to melt. I didn’t know you used real garlic! I will have to try it this way. Do you know how to make the Italian sub? I can’t remember what meats & cheeses were used. Genoa salami, cotton salami, and provolone cheese. The sandwich bread as simply pizza dough baked in a semi-circle. I LOVE crazy Bread! And this recipe is as close to taste as it gets! I’m a bread fanatic and garlic lover so combining the two is great. Thanks for this recipe! Hey, instead of Olive Oil, do you think I could use canola oil? best sub for bread flour..? I was thinking mix of AP and whole wheat? I think I would just make the recipe using the AP flour. Whole wheat flour isn’t a good substitute for bread flour. Bread flour has a different protein content, I would use the AP flour. Do i have to use bread flour, I have all pourpose and self rising will either of those work? You can use all purpose flour. Do not use self-rising flour. I love this recipe. I’ve been doin somthing similar, however I just use pre made pizza dough from the bakery. 1/2 tsp of garlic salt and the 2 tbls of butter is a good ratio, however I also add a few cloves of fine minced garlic and a pinch of parsley to the butter mixture before I heat it up. This gives it an extra lil kick and makes it better than crazy bread! Love anything made using garlic, maybe even ice-cream. This presentation I liked because it went to the subject without any loud fanfare music like so many do to glorify their own ego and in doing so diminish .joy of learning different methods of home style cooking and baking. I just want you to know you really can create delicious food at home, and it isn’t difficult to do! Do you like these or the Olive Garden Breadsticks the best? Really? Your parents must be proud.